Stem plants are some of the most popular plants available for decorating aquariums! Stem plants go well almost everywhere; in the background, along the sides, and in the center. They are fairly easy to propagate due to the fact that you can simply plant the cuttings from the present plants. These usually have long stems and look good when planted in groups. Hygrophila: The Hygrophila, one of the best leafy-stemed plants, looks similar to Ludwigia but needs less light and grows faster. Water Wisteria, Hygrophila difformis, is one of the most popular and hardy aquarium plants. Hornwort: Hornworts of the Ceratophylum group are hardy graceful plants with good plant growth. They have slender branches with many needle-like looking leaves. The branches will fan out in the aquarium making a beautiful decoration, but their fine thin leaves intercept very little light from any rooted plants below them. They are also valuable for egg deposits and offer a lot of shelter for baby fish and other shy fish to hide in. Though they may look delicate, they are seldom damaged by snails or plant eating fishes. 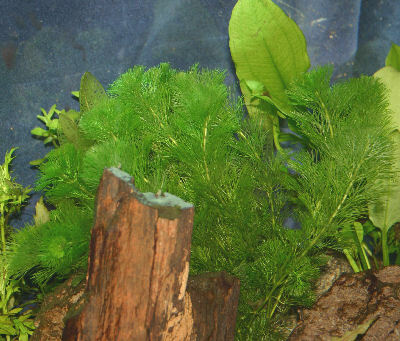 The common Hornwort, Ceratophylum demersum, is readily available and a great plant for both the beginner and the experienced aquarium aquascaper..